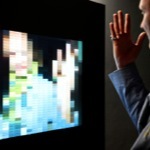 Rafael Lozano-Hemmer - Project "The Company of Colours"
"The Company of Colours" is the ninth piece in the Shadow Box series of interactive displays with a built-in computerized tracking system. 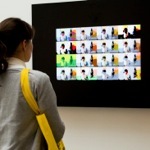 This piece shows a live surveillance camera view constructed out of a palette of named colour swatches that can be rendered by contemporary computers. 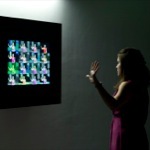 Every few minutes the piece automatically switches to show the live view constructed with a variety of culturally-significant colour palettes from computer and videogame history, including the 4 shades of green of the original Nintendo Gameboy, the eight colours of teletext, and the sixteen colours of the Commodore 64, the Apple II and the ZX Spectrum. The piece emphasizes the limited gamut of colour rendering possible with computers and the way this limitation creates styles of representation. 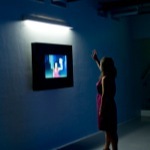 Keywords: database, indoor, projection, interactive, tracker. Group exhibition, D.I.X., Genève, Switzerland, 2018. 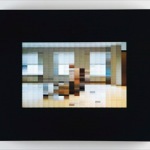 A different Kind of Order: The ICP Triennial, International Center of Photography, New York City, New York, United States, 2013. 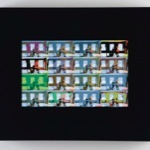 Hyperlinks: Architecture and Design, Art Institute of Chicago, Chicago, Illinois, United States, 2010 - 2011. ARCO '10, Galería Max Estrella, Madrid, Spain, 2010. Art Bologna, Galerie Guy Bärtschi, Bologna, Italy, 2010. Levels of Nothingness, Guggenheim Museum, New York City, New York, United States, 2009 (projection version). Commissioned by Works & Process at the Guggenheim Museum, celebrating its 25th anniversary together with the Museum's 50th anniversary. Funded by the Colección/Fundación Jumex, Deutsche Bank, German Consulate General and Mexican Cultural Institute.